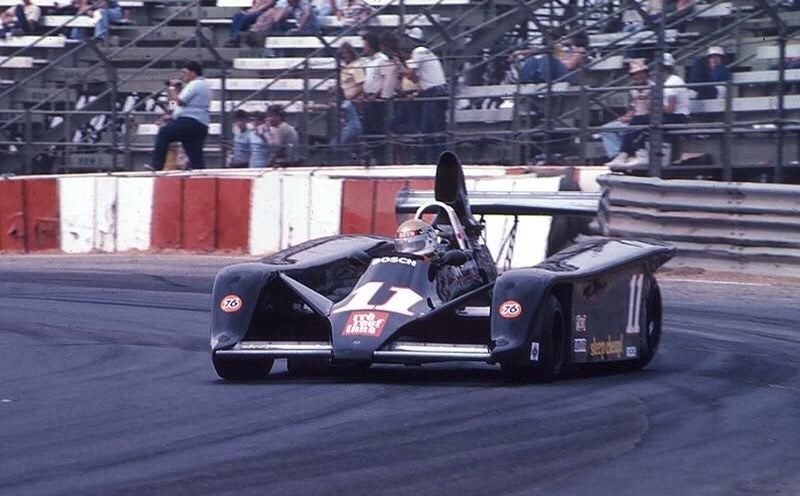 Here Vern is on the way to ninth place in his Elfin MR8A-C Chev during the Road Atlanta Can-Am round on 14 May 1978, the race won by Alan Jones far effective Lola T333CS Chev. 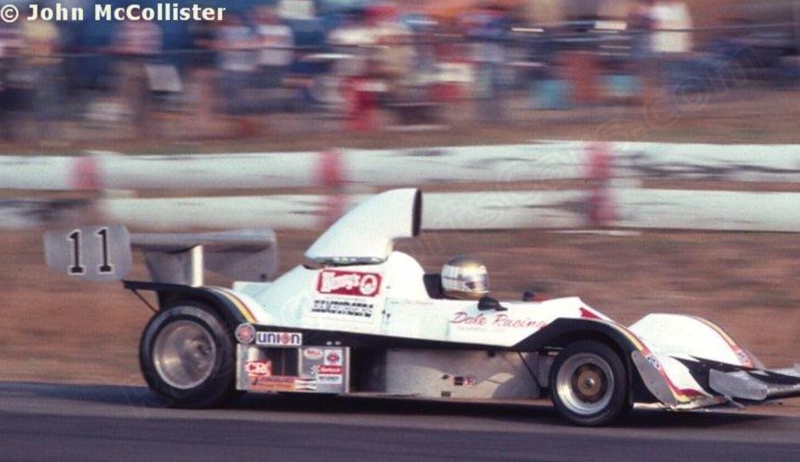 There were some fairly vestigial conversions of F5000’s to single-seat Can-Am cars in that post 1976 period but Schuppan’s must be one of the most thinly disguised of them all?! 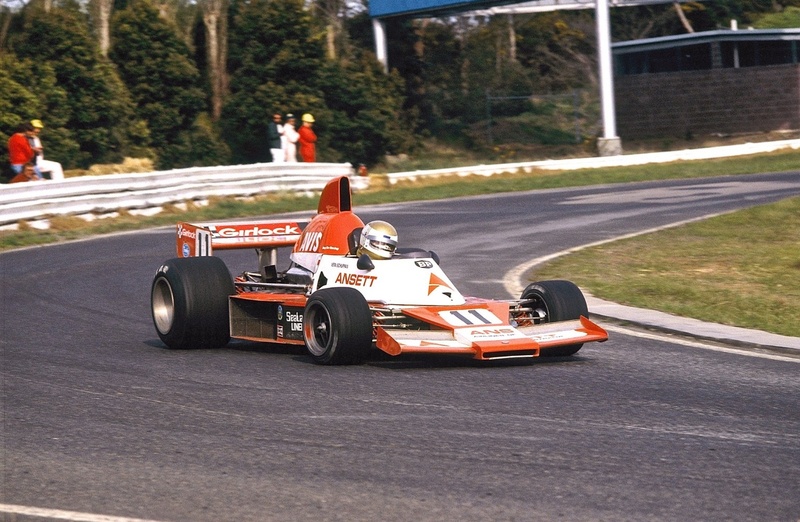 By way of comparison, below, is Elfin MR8B-C Chev ‘8783’ F5000 at Sandown Park in Februay 1978, a far prettier, ‘more resolved’ design in terms of its body. In a mixed weekend Vern put his Ansett Team Elfin car on pole but then blew an engine after 5 laps of the Sandown Park Cup, the race won by Warwick Brown’s Team VDS Lola T333CS Can-Am car converted to T332C F5000 specs. 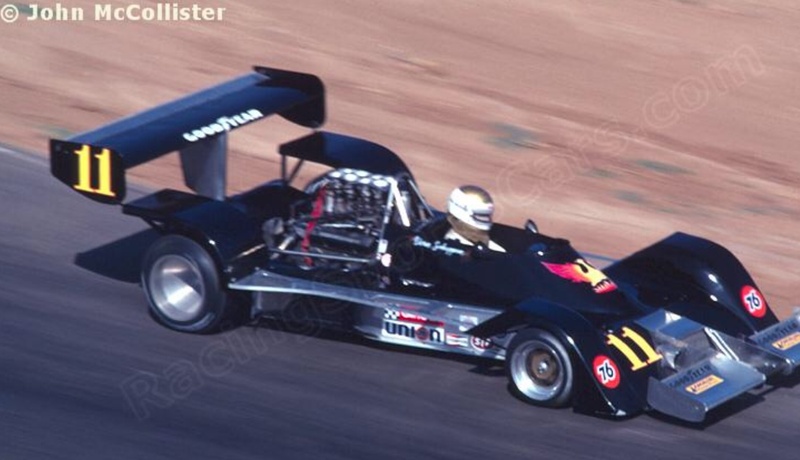 Amusing that, a Can-Am Lola reverting to F5000 spec rather than the other way around. 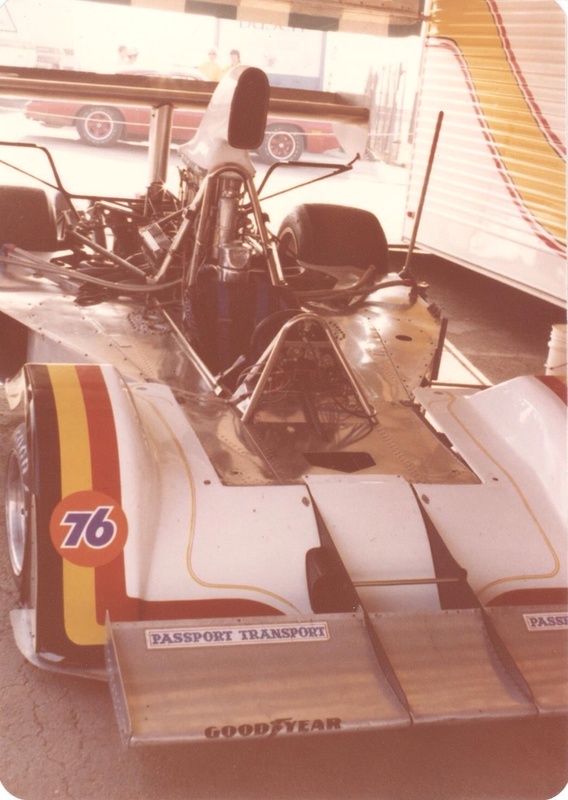 Schuppan first tested an Elfin MR8 at Adelaide International raceway several days after winning the 1976 Australian Rothmans International Series in Teddy Yip’s Theodore Racing Lola T332 Chev. Together with Garrie Cooper they sorted the car which Vern raced in Australia throughout 1976 as his international commitments allowed. 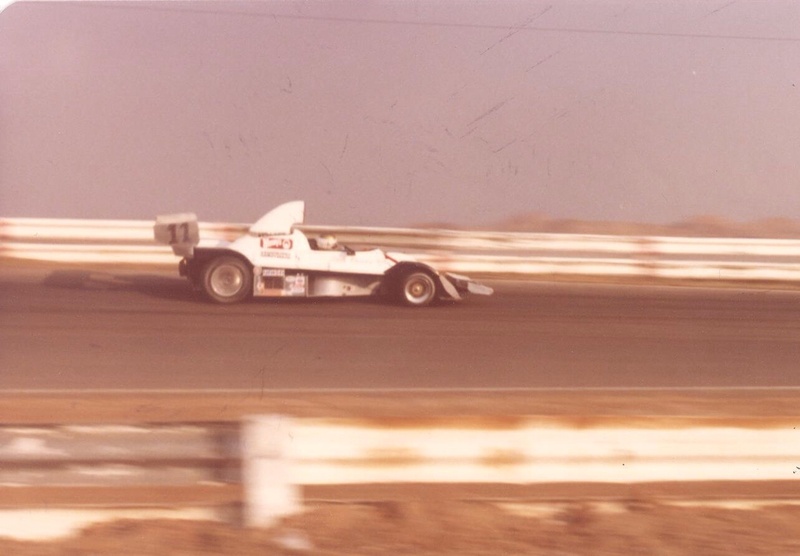 Despite not being a fan of the SCCA’s decision to cease F5000 at the end of 1976 in favour of a single-seat 5 litre Can-Am class- in search of the unlimited Can-Am’s spectator appeal as the sanctioning body and the circuit promoters were, Vern decided to compete in 1977. Rather than buy a Lola T333 or the T332CS conversion kit to turn a T332 F5000 into a T332 Can-Am machine he decided to take an Elfin MR8 to the ‘states. 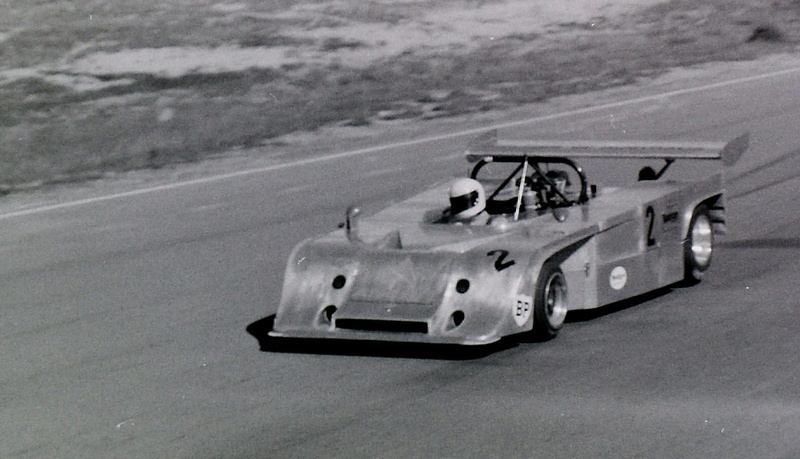 Elfin’s renowned sheet metal worker and body builder John Webb, together with Garrie Cooper built an all enveloping aluminium body based on that Garrie had used in his one-off MS7 Repco Holden sportscar which first raced in 1974. 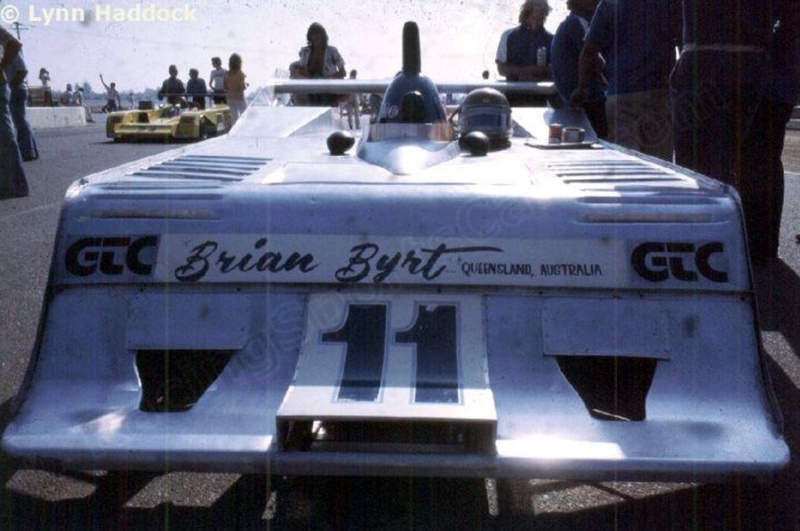 The body was fitted to Elfin MR8A-C chassis ‘8772’ which Vern first raced as part of Ansett Team Elfin in the 1977 Australian Rothmans Series. He was 5th with an overheating engine, 7th after a tyre deflation and change, DNF pushrod, DNF oil leak at Oran Park, Surfers Paradise, Sandown and Adelaide International respectively. That car Elfin MR8 ‘8772’ was despatched by sea to the US with the Can-Am body built in Edwardstown, using Garrie’s MR8 as the ‘slave’ upon which it was formed. When completed it was shipped across the Pacific and fitted and fettled to suit Vern’s car, slightly different in shape to GC’s. 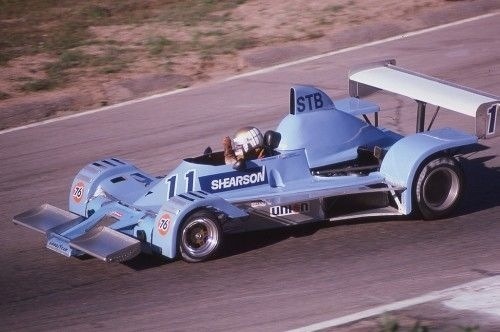 Due to Vern’s Surtees F1 commitments and loss of his Can-Am sponsor he delayed the debut of the Elfin until the October 1977 end of season Riverside round. The Adelaide driver qualified the new machine a good ninth- the team having only the three practice days to do all their sorting. He finished 22nd, 5 laps short of race and series winner Patrick Tambay’s Lola T333CS Chev after sustaining body damage. Heading into 1978 the team planned a full assault on the title won by Alan Jones in the Carl Haas Lola T333CS Chev. Perhaps the nearly two second gap between Vern and pole-man Jones at the opening round at Road Atlanta was indicative of the year to come. Schuppan was 5th and finished 9th with Jones first- the first five cars were Lolas. At Charlotte in May he was 5th but Vern thought the car ‘wasn’t strong or light enough. We broke the rear suspension at Charlotte and had K&A Engineering in Adelaide design a new suspension and I had a lighter fibreglass body built. Still we were not as fast as the Lola’. The ‘Elfin bible’ says that ‘Vern commissioned John Webb to fabricate lightweight bodywork…He despatched the panels to the USA where they were added to the basic MR8-C open wheeler body…’ I wonder if the (other) Webb bodywork is the ‘cycle-guard configuration’ or the more substantial final Can-Am body the car used in 1979? Or both. The team missed Mid Ohio, Mont Tremblant and Watkins Glen before reappearing at Road America in late July- Vern was sixth having qualified ninth. Jones again won from Warwick Brown and Al Unser, both in Lola T333CS. 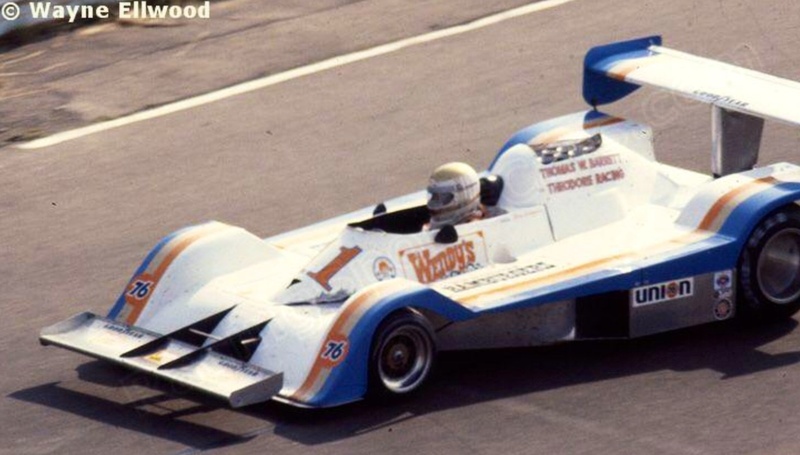 The interim bodywork (interim in the sense it was the second of three bodies used on the Can-Am configuration of the car) of the car was developed by Boxx and his team in the US- whilst it was undeniably light it gave away much in both drag and downforce as other teams evolved their Lolas. Off to Canada later in August Vern qualified and finished sixth at Mosport, this time with roughly 2.5 seconds between Vern and Jones on pole. Alan won from fellow Aussie Warwick Brown’s Team VDS Lola T333CS and similarly mounted Al Holbert. At the celebrated Grand Prix de Trois-Rivieres in Quebec Vern qualified fourth and finished seventh. Elliot Forbes-Robinson won for a change in the Spyder NF-10 Chev. 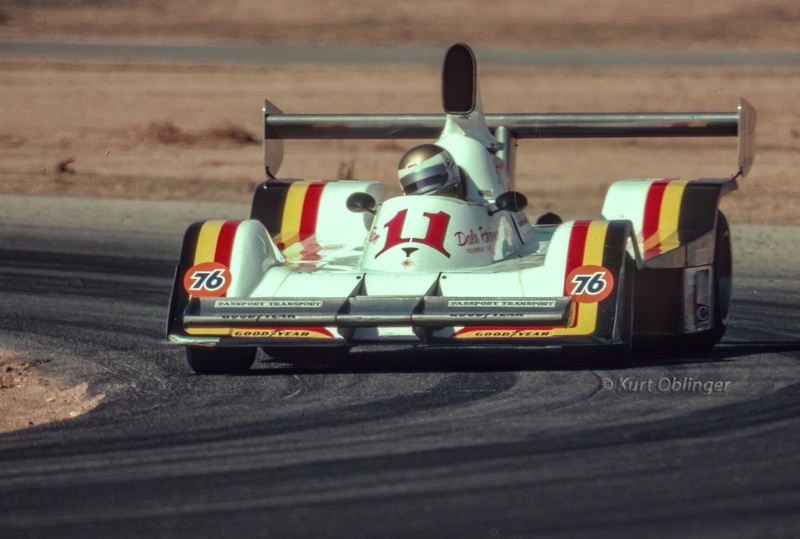 In the two end of season October California races Vern was Q7 and DNF at Laguna Seca- a week later he qualified fifth but failed to finish after popping an engine at Riverside. Jones won the championship taking five wins from the nine races he contested- all from pole. Warwick Brown was second and Al Holbert third, all of the guys aboard Lola T333CS. 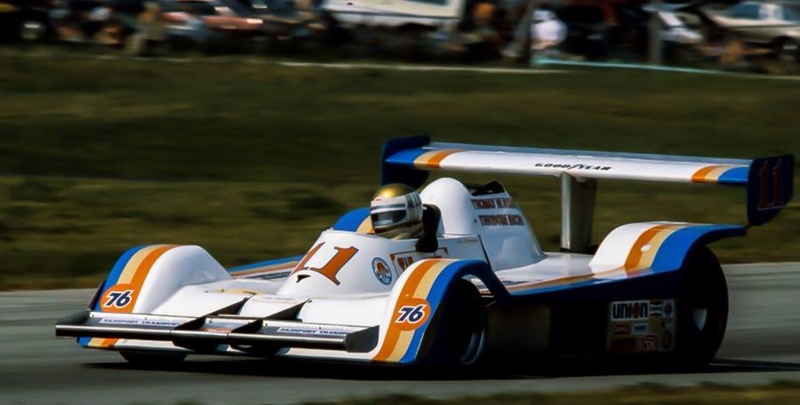 The 1979 season started at Road Atlanta in May, with Vern missing that event, Charlotte, Mosport and Mid Ohio before making the race debut of the car with its new, all-enveloping, fibreglass bodywork at Watkins Glen in early July. He was six seconds shy of Keke Rosberg’s Spyder NF-11 Chev on pole but in a race of attrition finished a gritty third behind Keke and Geoff Lees VDS Lola T333CS Chev. 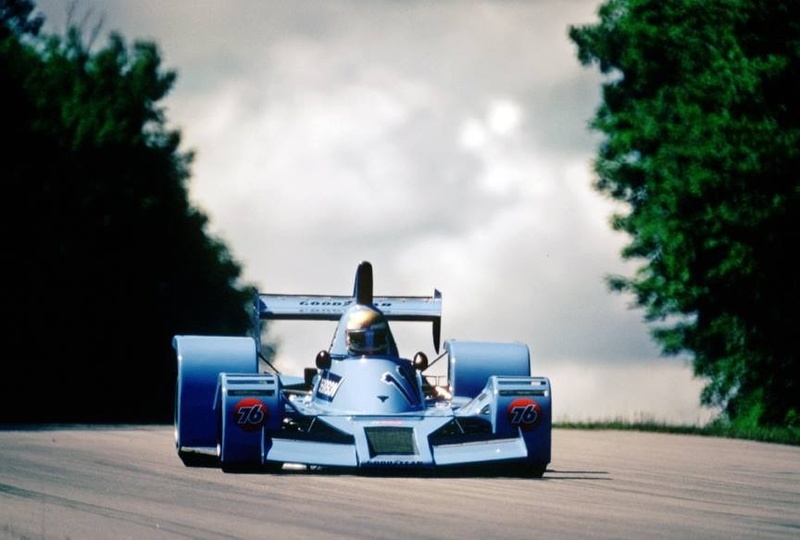 Road America, Wisconsin, 22 July 1979, Vern was 5th in the race won by Jacky Ickx in the Haas-Hall Lola T333CS Chev from Geoff Lees T333 and Al Holbert’s Hogan HR-001 Chev. At Brainerd Vern qualified tenth but popped an engine after completing 19 laps, Ickx won. Schuppan missed Trois-Rivieres but raced both the California season-enders. 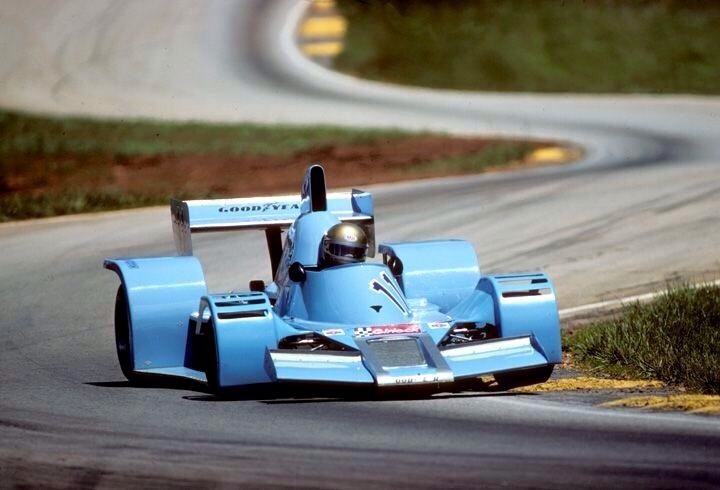 He was Q9 and seventh at Laguna Seca with Bobby Rahal taking the win in his Prophet Chev. For the season ending Riverside meeting on 23 October- his last Can-Am race in the Elfin, Vern finished where he started in terms of the outright speed of the car, he was about two seconds off pole- Keke Rosberg’s Spyder NF-11 Chev on this occasion. He finished five laps down with mechanical problems, Jacky Ickx’ Lola T333 was the victor of both the race, and with five wins, the series. In an effort to become more competitive in the 1980 Can-Am Vern acquired two F1 McLaren M26’s with a view to having Howden Ganley’s Tiga Cars convert them into Can-Am machines, but then changed tack buying a bespoke Tiga CA80 instead. The car, based on Tigas’s F2, ‘F280’ appeared in the last two rounds of the season at Laguna Seca and at Riverside (below) with the plucky Aussie unable to qualify the cars in the top-ten. He was classified sixteenth at Laguna after a water leak, completing only 37 laps and fourteenth after an engine failure on lap 41 at Riverside- after that the car was not raced again. The McLaren’s were on-sold to Porsche Cars Australia chief Alan Hamilton. In Alf Costanzo’s hands one of the Tiga converted ‘ground effect’ M26 Chevs became the ‘jet of the field’ in the dying days of F5000 in Australia. But the Elfin Can-Am adventure was over, perhaps the results of the under-funded and resourced little team were unsurprising against the bigger teams at the head of the field. ‘8772’ survived the ravages of its ‘in period’ racing fairly well, and was ultimately converted back to F5000 specifications. It’s owned by Bill Hemming and can usually be seen on display at his Elfin Heritage Centre in Melbourne. This intriguing story can be added to by your researching just two names– John Wales and Ron Gouttman–John Wales, Australian Singapore-based businessman whose Ferrari was driven by Ron Gouttman in Targa Tasmania . Their Targa accident with John Wales as navigator damaged Ferrari and him a bit (“I only realized we were having an accident when the end of the telephone pole came in through the cabin and took my knee out”), so attention went to another of his cars: this ex Vern Schuppan Elfin. Having raced only an historic Fiat 1500 previously, Ron open-trailered the Elfin to Phillip Island, told me in his unique way on Saturday “it turns in well” and said he was surprisingly close to Bob Minogue’s Lola T430 lap record– and survived…..
Oh yes, I should mention that I first met John Wales at Eastern Creek when Ron was pushing him around in a wheel chair, result of the Targa accident. 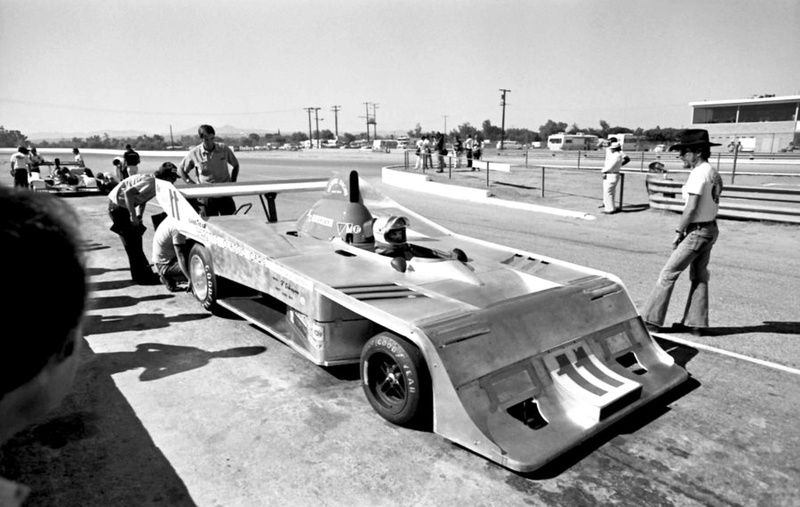 Some great photos of the Elfin Can Am – most I have never seen before! I can had a little detail to the Tiga Can Am experiment. My understanding (from speaking to VS) was that he purchased the two McLaren M26s and spoke to Howden Ganley (of Tiga) to turn them into ground effects Can Am car, because Tiga apparently had experience doing this on a McLaren M23. However the work involved was significant and it was decided to develop and build a ground effects Can Am racer in-house – what became the CA80. Note that Schuppan didn’t purchase a CA80 off the shelf – it was commissioned by him. 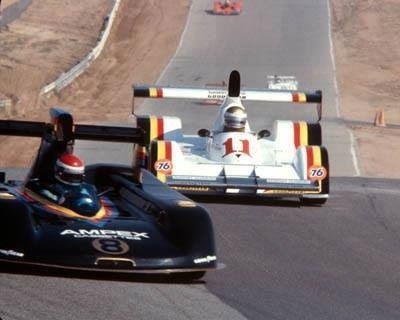 Apparently there were two CA80s built and they were fitted with VDS Chevrolet engines for the two Californian Can Am races. These engines lacked power due to issues with the throttles but otherwise showed promise. After the Riverside race VDS tested the CA80 at Willow Springs but didn’t pick up the project. Instead they developed their own VDS 001, which was based on the current Lola T530 that no one had a good word for. 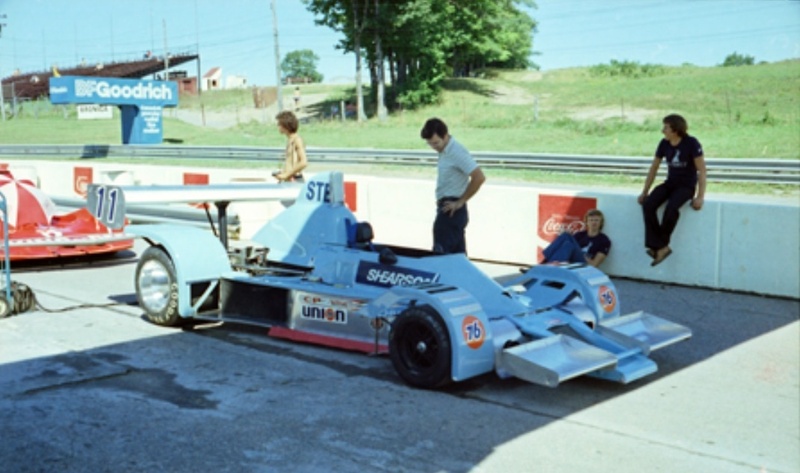 Schuppan didn’t want to fund a Can Am project out of his own pocket so the CA80 was parked and never raced again in Can Am. As is well known the McLaren M26 complete with ground effects (by Tiga) were on sold to Alan Hamilton for Alfie Costanzo to use to win the 1981 Australian Gold Star. As an aside Vern Schuppan was good mates with Howden Ganley – they were both in the BRM F1 team and Gulf Mirage team in 1972-73. Ganley and Tiga went on to construct the ill-fated Schuppan 962CR road car in the early 1990s – but that is another story! Great stuff- whilst I am well familiar with the McLarens I didn’t know Tiga had built a Can-Am car till researching the Elfin article. It’s a pity for them VDS didn’t pick it up- I tangentially wrote about the VDS001 in an article on Geoff Brabham. Did not realise that Howden was involved in the 962CR build- many thanks for fleshing out the story some more. Interesting! I was there that day, Vern didn’t race of course and Alfie was the quickest F5000 qualifier in Hammo’s T430. What would have been interesting was how quick the M26 F5000 would have been had it been ready then- I notice with a quick look at ORC that Vern was entered in the McLaren as well as the Tiga. Alfie in the M26 would have been something, I am not saying he would have knocked off Jones or Jack O’Malley- man that Alfa was something to see and hear! It looks as tho the McLaren’s first race was the Sandown Gold Star round in February 1981, only several months later. As to conversion of the CA280 to an F5000- sounds much harder than conversion of the T333CS Lola to a T332C given the derivation of the T333!